We live in an era where digital innovation is both possible and necessary. This comes with many benefits but can sometimes bring some financial risks. Companies have to invest in new applications or extensions tailored to their existing environment. It is logical that such solutions are expensive... or aren't they? Some time ago we decided to accelerate our development process. Since then, we have built SAP applications in a faster and more efficient way, with a better time to value. We'd be happy to explain how we accomplished that! At the end of 2017, the SAP team announced they would enhance their partnership with Mendix. The Dutch platform has been the market leader in the area of so-called low-code applications for years. Building applications in a simple way. Mendix can be compared to the so-called WYSIWYG website builders: you can efficiently and easily drag and drop the customizable blocks, and your app is ready to go! An effortless first encounter with digital innovation. Innovating digitally is key for companies who want to survive. Mendix gives them the opportunity to taste digital innovation in a relatively easy way. It is the perfect platform to experiment with new technological solutions. This is how you will discover in a very short amount of time (and without huge investments) whether IoT, Machine Learning, BI and other digital innovations will meet your expectations. Creating secure innovative solutions. Digital innovation can also make companies vulnerable. That is why Mendix provides a safe environment to create new innovative solutions. The tool ensures that your apps are accessible in a secure way, whenever or wherever you need them. Long story short: Mendix is the ultimate tool for companies who want to kickstart their digital innovation in a simple and low-cost way. And we have some more great Mendix-news to tell you! We may safely refer to the partnership between SAP and Mendix as “a match made in heaven”. The world leaders in enterprise applications and low-code platforms have launched a powerful product through this collaboration: SAP Cloud Platform Rapid Application Development by Mendix. This close cooperation between SAP and Mendix has been in place for just over a year now, which means that all SAP Cloud Platform users can also use the low-code platform from that time on. The results after one year are impressive: on average, an SAP application is developed 6 to 10 times faster than with traditional development approaches. We have been using Mendix within SAP Cloud Platform since its launch, and we love it. Besides that, our customers also notice the added value of this partnership. We are happy to share with you the three most important 'reasons to use' of this partnership. Words like 'customization' and 'cheap' are hardly used to describe the same product. However, they do apply for this solution. Mendix within SAP Cloud Platform makes developing custom applications for your standard SAP software cheaper than ever before. Additionally, Mendix is the ideal tool to migrate towards SAP in the cloud. The possibility to create custom solutions for SAP Cloud Platform makes the system accessible to anyone who uses an on-premise solution nowadays. At the same time, Mendix makes it a lot easier to integrate your application with existing SAP Systems (such as S4/HANA, C4/HANA, or SuccessFactors ). Building an innovative (responsive) SAP application is much easier than before thanks to Mendix. It prevents you from creating thousands of lines of code, allowing business and IT to scale faster. Visual development within Mendix allows everyone with a limited IT knowledge to build and maintain simple and user-friendly SAP applications themselves. This reduces your dependency on your IT department, allowing them to focus on other matters. Mendix is the only low-code solution within SAP Cloud Platform. In fact, it is actually an SAP Solution Extension Partner. This means that SAP provides contracting and support, which makes it a lot more user-friendly than any similar app. On top of that, Mendix users do not have to worry about potential bugs in their code. The Mendix Modeler tells them immediately when a part of their code is missing or incorrectly applied. As a result, you don't waste time searching for errors but can instead focus on what really matters: building powerful applications in a limited amount of time. 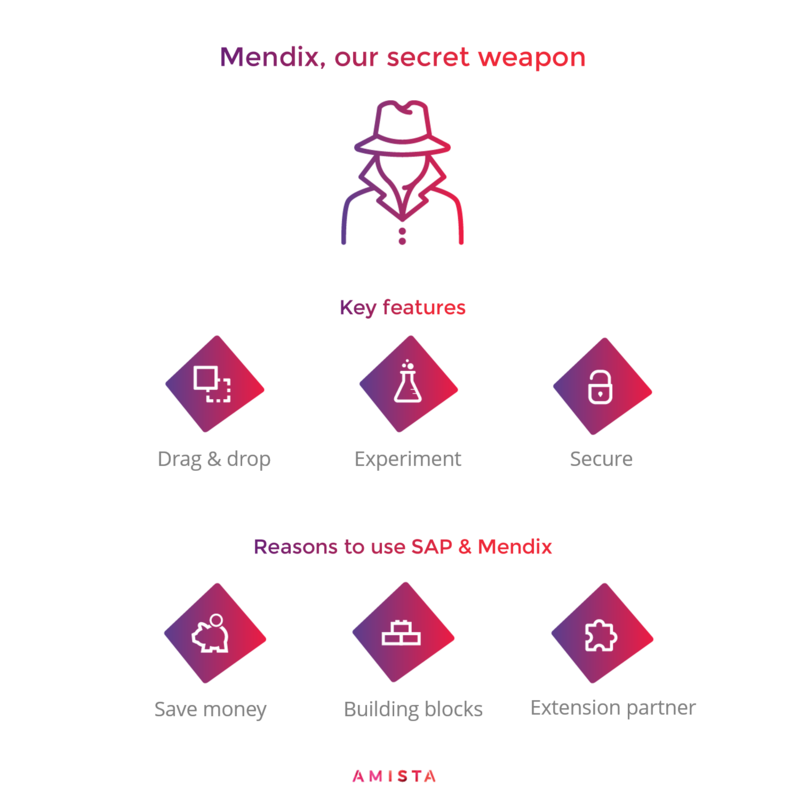 Do you need Mendix within SAP? Are you wondering if Mendix within SAP Cloud Platform fits your business needs? That depends heavily on your specific situation. If you want to create a simple application which can be backed by an existing solution, Mendix is the way to go. Do you prefer to have the code of your own tool at your disposal? Then we use Mendix in a different way. We often leverage the platform to quickly create models or MVPs from scratch. This way, we don't waste any time with overgrown prototypes and we can quickly scale up your digital innovation. A win-win! If this sounds interesting, you can always contact us for a free consultation to discuss your business needs. We'd be happy to help.